Harold Bergh - Donor - The Eye-Bank for Sight Restoration, Inc.
Born and raised in the Inwood section of Manhattan, Harold known to his friends and family as “Harry” loved life and people. He attended local schools and became a plumber by trade. He married Jane Lowry in 1964 and they moved on their 7th wedding anniversary to Brewster, NY. He wanted to become involved in his community so he joined the Brewster Volunteer Fire Department. 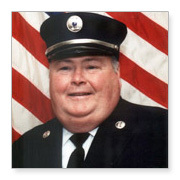 For the next 33 years he was an active member and Captain of the fire police. He loved to fish with his boat on the local lakes, but his greatest joy was hunting. He never missed an opening day of deer season since he started hunting at age 16. His favorite holiday was the 4th of July. He loved fireworks and a great barbecue with family and friends. The last nine months of his life he was on dialysis for kidney failure. He would have loved to be on a kidney transplant list, but because of other health problems, he knew this was not possible. Since he was not able to get the gift of a kidney, I know he would have wanted his eyes to be donated so someone could enjoy life to the fullest the way he did. He was a wonderful husband, friend and Uncle Harry to many.